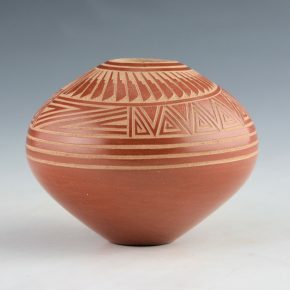 The art of Jemez Pottery making was revived in the 1800s after being lost during the Spanish conquest of the American Southwest. 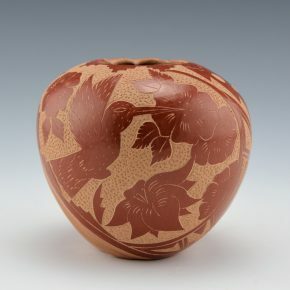 After being developed in the traditional style, the pottery has been enhanced over the generations to include several wonderful clay colors and traditional shapes. 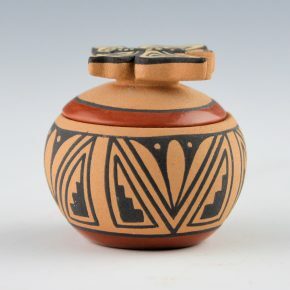 Jemez Pueblo Pottery has also been influenced by later generations by polishing and incising the pottery, fine line painting, inlaid stonework and storyteller figures. The Pueblo of Jemez has a closed village policy due to the lack of tourism facilities and out of respect for the privacy of those who live there. The village is, therefore, open to the public only on Feast Days. The Pueblo now chooses to no longer allow these days to be publicized due to overcapacity and for the reasons stated above. Visitors should go to the Walatowa Visitor Center which is open year round. Do not wander around the village. 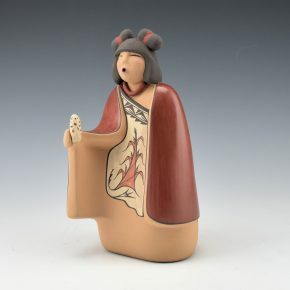 Maxine Toya is well known for her figurative pottery. Each piece is coil built and stone polished and painted with natural clay slips. This is one of her Corn Maiden figures. The Corn Maiden has a fully polished shawl which she is wearing. On her manta is a very delicately painted corn plant and she is holding an ear of corn in her hand. Note the intricacy in the face and the overall painting. It is signed on the bottom in the clay, “Maxine Toya”. 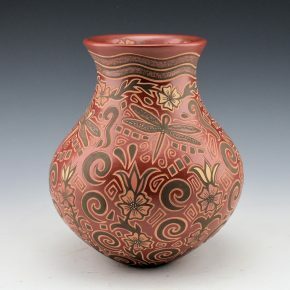 Glendora Fragua is known for her polished and intricately incised pottery. 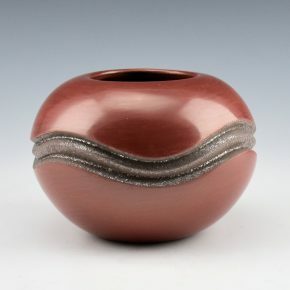 This water jar is larger in size for her work and it is polished with a red clay. The entire surface is fully etched with four large dragonflies, flowers and additional designs. The various designs are then highlighted with additional clay slips. On the inside of the neck has also painted a flower pattern! It is an intricate and complex jar with a striking combination fo designs, both painted and incised. The jar is signed on the bottom with a corn stalk, Glendora’s hallmark. 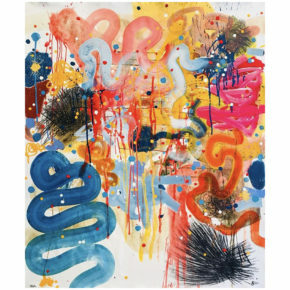 Phillip Vigil is one of the exciting, young native painters working today. His modernist designs are a play on his life, culture and personal experiences. 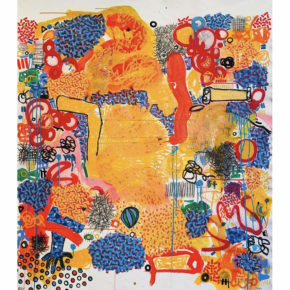 Phillip has primarily been working on paper, but the transition to canvas has been an exciting change in his art. 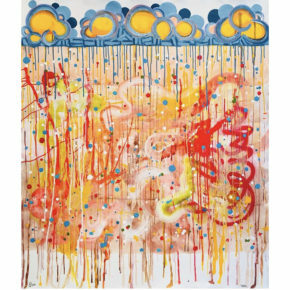 In a 2011 “Rethinking Contemporary Native American Art” article in “THE” magazine, they included Vigil saying, “Phillip Vigil seeks his identity as a contemporary creative type who is also an indigenous person. He is self-taught, inspired to paint by his love of the comic strip Calvin & Hobbes”. “I think of this painting as a metaphor for life. Just as no river ever really flows in a straight line, neither do our lives. The big blue streak of color is representational of the, ‘curving river’ and the way things always unexpectedly ‘pop-up’ in life to challenge us and change our direction. We are pleased to represent his paintings in our Scottsdale gallery and look for more from this amazing artist! “This painting represents my return to painting on canvas. It is the largest of my first four recent canvas works. While I’m primarily known for works on paper, returning to the canvas has been a seamless process. The larger expanse of space available to paint has ushered in a new perspective for me. I no longer feel contained by the limits of the paper size and it is quite freeing. “’Rain’ is about the rains which come during the monsoons throughout our southwestern summers. The big thunder clouds build up in the distance and the you can see the rain flowing downward from them. I currently live in Jemez Pueblo and here, rain is our everything. It sustains our people or grows the chili or corn which are part of my daily life. Dominique Toya is known for her intricately carved pottery with sharp ridged melon swirls. 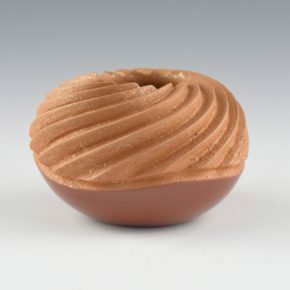 She has created her distinctive style of pottery using native clay and micaceous clay slips for the surface. 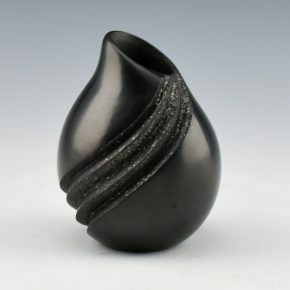 This is one of her miniatures which has been fired black. 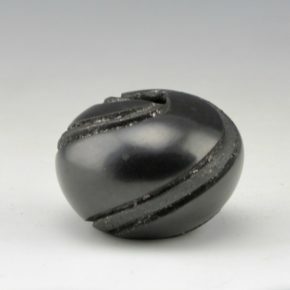 The seedpot has a triangular opening and there are alternating polished and micaceous clay swirls. The micaceous sections are carved into the clay and slipped with mica and when fired have almost a silvery metallic appearance. The polished sections are flatter. Dominique has won numerous awards for her pottery and continues to be one of the leading Jemez potters working today! 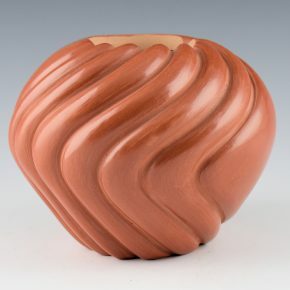 Dominique Toya is known for her intricately carved pottery with sharp ridged melon swirls. 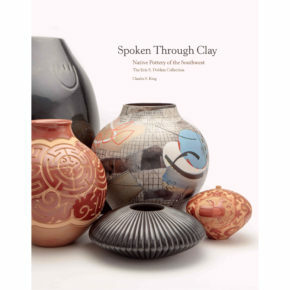 She has created her distinctive style of pottery using native clay and micaceous clay slips for the surface. This is one of her miniatures. The bowl is fully polished red on the bottom and the top half has a 16 very sharply carved melon ribs which swirl around from the mouth. They are slipped with a micaceous clay. The bowl has been traditionally fired and the coloration is striking! Dominique has won numerous awards for her pottery and continues to be one of the leading Jemez potters working today!